While most consider luxury and casual as opposite concepts, a young sushi master with a brand new vision is aiming to bring them under the same roof. Renowned for its dynamic ideas and international mindset, Ishibashi Masakazu has become the latest culinary sensation at the heart of Tokyo’s high-end dining scene. Trained overseas and freed from old ways of thinking, Chef Masakazu Ishibashi is unafraid to experiment with the world’s best delicacies from fatty tuna to caviar. Dressed in soft-colored silk kimonos, Ishibashi and his wife greet every guest with gentle smiles, creating an inviting atmosphere where you can relax and enjoy the highest quality meal, without formality. Everything about the restaurant reflects Ishibashi’s pure vision and kind character, and thus taking his full name. From the ceiling to the walls, he has selected the finest craftsmen to design a sophisticated interior. 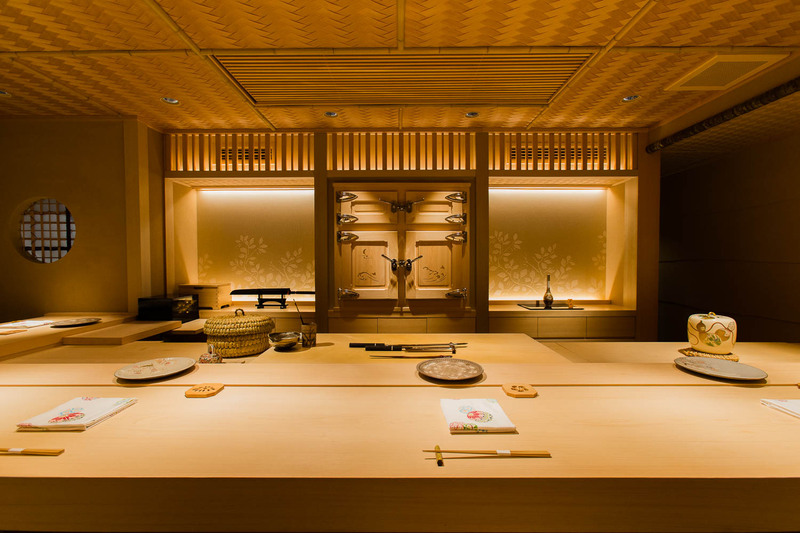 Unlike many high-end sushi restaurants, he uses light colors and bright lighting, creating a sense of warmth and openness. The collection of selected ceramics is all of gentle colors and delicate designs too. The wide counter is made flat and low so that nothing bars the chef and the guests. On the wall behind him, you can’t help but notice the intricately decorated wooden chest with silver latches. They are doors to the fridge where all the fish is kept. The panels are designed by a craftsman of makie, an ancient design technique that decorates using gold and other powders on lacquer. His deep appreciation for both local and global cultures have led him to build an international client base and a network of like-minded craftsmen. 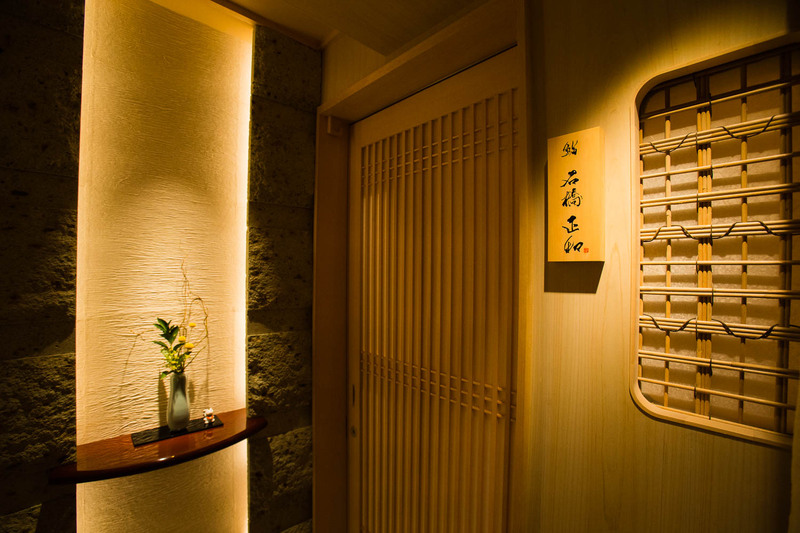 The beautiful woodblock signage at the restaurant’s entrance is a work of Koki Sugita, a renowned Japanese calligraphy artist based in New York. The omakase menu, which means that you leave the selection to the chef, is a mix of six tsumami dishes and 15 kinds of sushi. 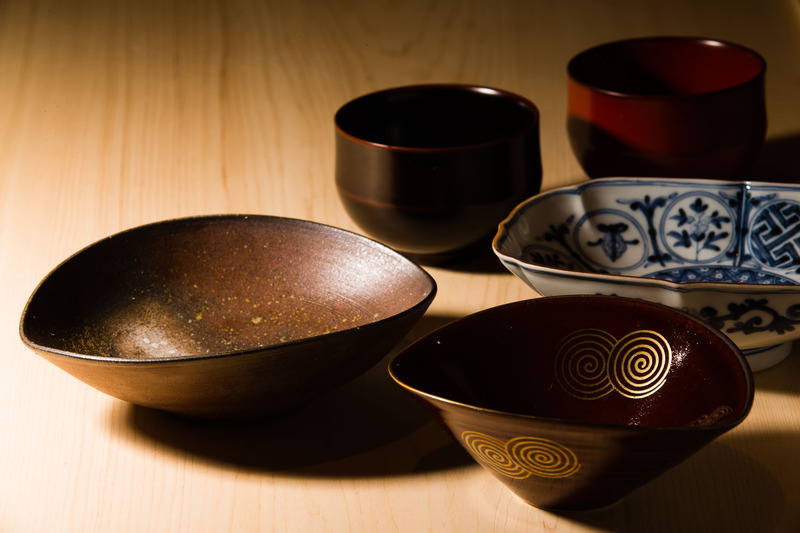 Every tsumami course comes with great thought and preparation, including a careful selection of what piece of ceramic it should be presented on. 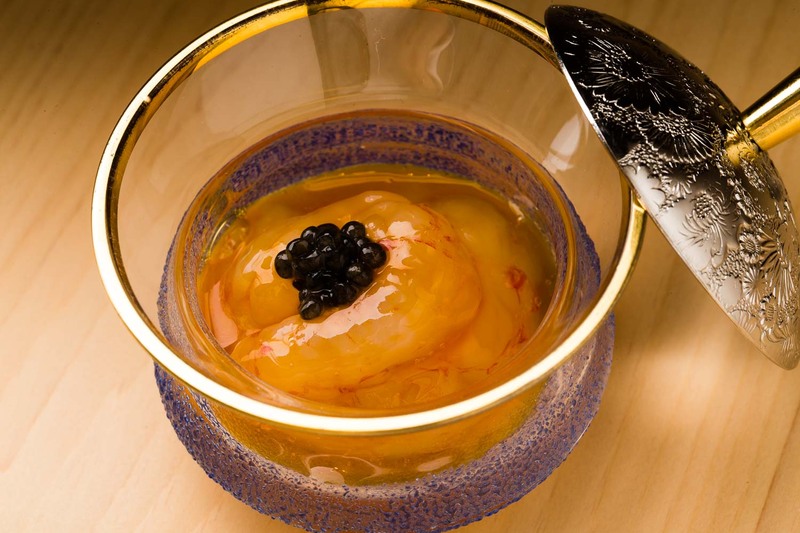 Served in glass tea cup with a golden rim and a decorative silver lid is a breathtaking dish of grey prawns coated in egg yolk sauce and topped with caviar. A piece of sweet nodoguro is served with peppery sansho herb, mountain yams and myoga ginger. The trio of aromatic vegetables, each with a different and refreshing flavor, balances the fattiness of the rich fish. Steamed abalone is so flavorful it needs to be enjoyed twice. 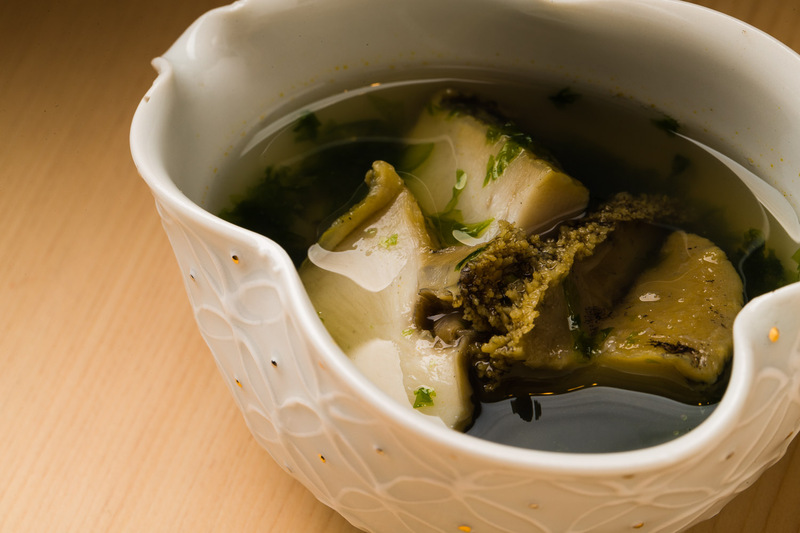 Served in two matching ceramic bowls, you first sip the broth, simply flavored only with the shellfish and fresh seaweed. Then, the soft and tender flesh packed in deep umami from the sea. Behind each sushi course hides many secrets too. 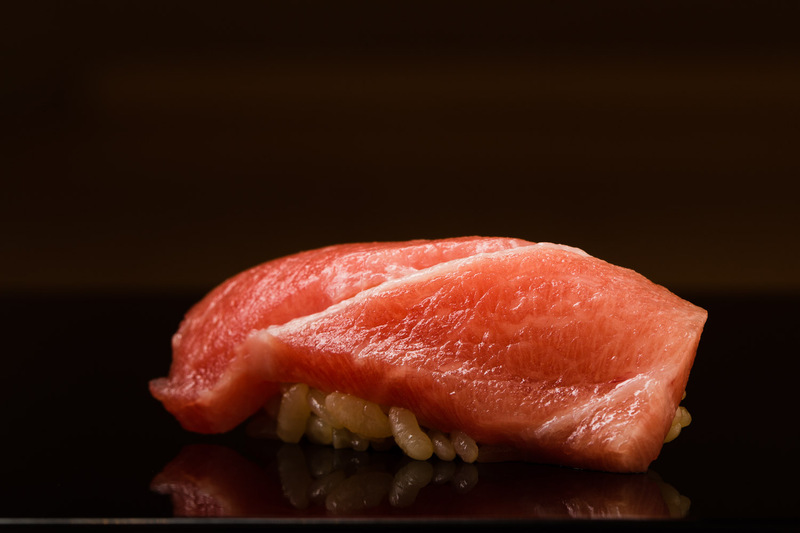 The akami, the red meaty slices of tuna, is rested for over a week for its flavor to deepen but not losing its freshness. 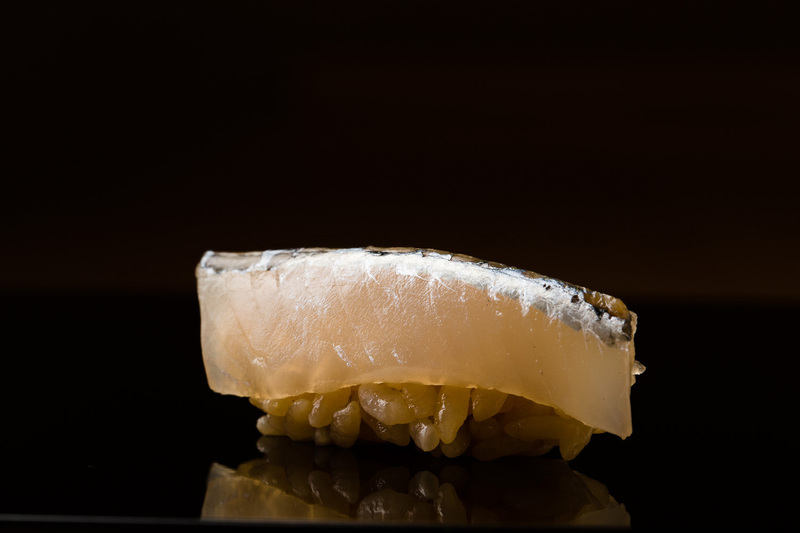 Kinmedai, golden eye snapper, is rested for as long as two weeks, and sayori halfbeak is infused in kombu for greater umami. Ishibashi is very selective of his tuna and only serves the best he can find at the Tsukiji market. 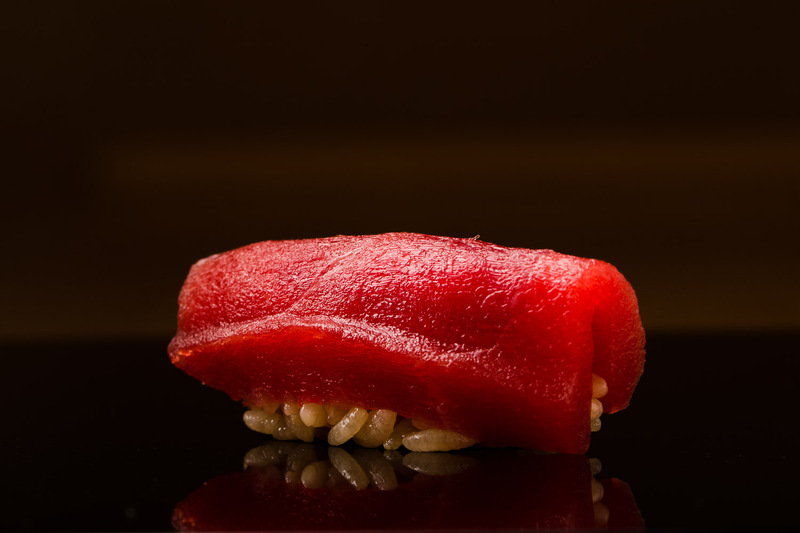 The generous slice of marbled fatty otoro tuna gently hugs around the rice, tinted with red vinegar. 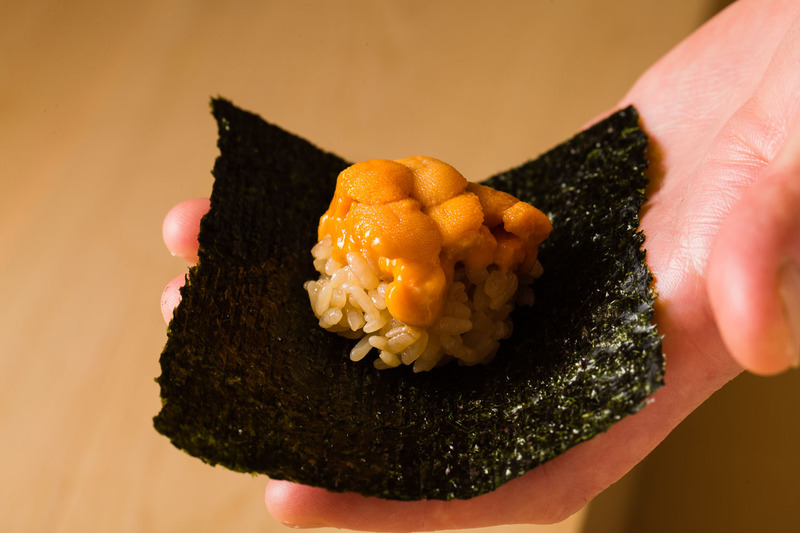 The fresh sea urchin is so creamy and soft it starts melting over the warm rice as it’s made. To not waste seconds, Ishibashi passes the roll straight into the guest’s hand while the seaweed is still freshly crisp. 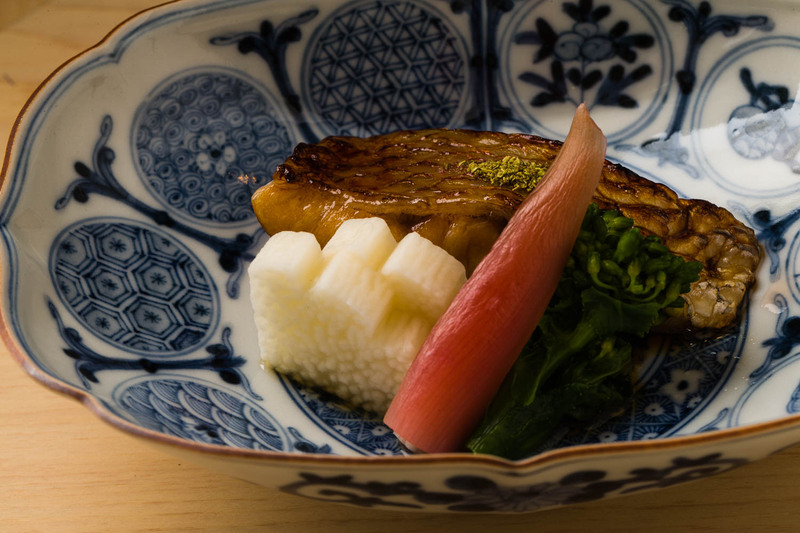 The rice is a blend of Nanatsuboshi and Akitakomachi with the former being more flavorful while the latter adds more texture. He also pays careful attention to the temperature of the rice as he believes that warmer rice is more tasty, again a move away from the traditional rules of edomae sushi. Ishibashi makes daily trips to Tsukiji for the best fish. Among all, Ishibashi has the greatest passion for tuna. He buys from Tsukiji’s Hicho, one of the most established tuna suppliers, and is selective about specific technique and styles that were used to catch the fish. Another of his favorite ingredients is the Aosa seaweed from Kyushu. He likes it for its crispness and deep aroma. Sushi was in Ishibashi’s DNA from the start. His family ran a sushi restaurant in Tochigi Prefecture and he spent a lot of time behind the counter growing up. By high school, he could make pretty good sushi. He took a surprise turn after graduating from high school, when he decided to go to the U.S. He began working for a sushi restaurant abroad instead of learning from his own family or joining other local restaurants. But it was perhaps his departure from Japan that has led him to become one of the most creative young sushi chefs in Tokyo today. Working abroad, he discovered that his sushi can bring joy to people from various cultures, pushing him to improve his sushi skills and English. After 5 years, he returned to Tokyo and joined a top notch sushi restaurant in Ginza, which won a Michelin star. He also helped their Singapore branch win two stars. In 2017, he finally decided to open a restaurant he could call his own. With his great English skills as well as culinary talents, Ishibashi Masakazu quickly attracted international guests as well as Japanese foodies. His wife has been a strong pillar behind Ishibashi’s successful career. As maître'd of the new restaurant, she serves each guest with great hospitality and helps him with various aspects of the business. Outside work, the happy couple also shares the love for drinking and they look forward to trying out different restaurants on weekends. Their bond has been an important source of Ishibashi’s energy and well being. “I didn’t want to create another ‘Ginza’ sushi restaurant,” Ishibashi explains. Free from old traditions and rules, he wants his cuisine to be experimental, creative and entertaining. “The most important thing is that the guest enjoys it,” he says. He adds that he wants his restaurant to be welcoming and inviting to guests from any country. To extend his international reach, he also consults a number of sushi restaurants in Hong Kong and Taiwan that wants to learn his skills and ideas. He hopes to continue expanding his global network and spread the best of Japanese traditions. Most of Ishibashi’s tableware is kyo yaki, decorated Japanese ceramics produced in Kyōto, ranging from antiques to modern designs. 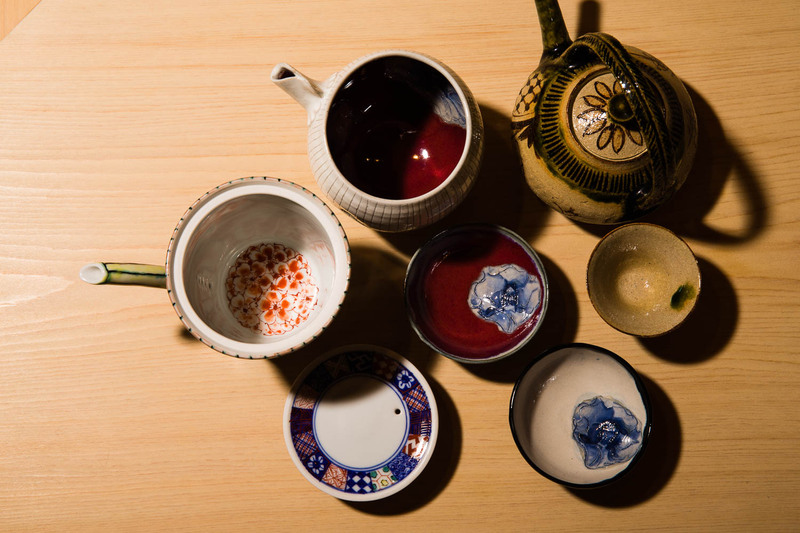 At times he incorporate tools from tea ceremony as tableware. Again, he likes to experiment with traditions. The sake bottles are his wife’s tasteful selection. Many are with delicate designs such as a bottle with beautiful flowers drawn at the bottom of the ceramic. She likes to match the bottles to the flavors of the sake, making the drinking even more enjoyable.